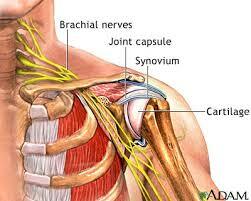 As previously stated the shoulder joint is a very mobile one but is a relatively unstable joint. In actions such as throwing, at the end of the action, the joint has to be decelerated quite quickly after releasing the object. The rotator cuff muscles are partly responsible for this protraction against potential dislocation.